Student athletes face significant pressures balancing academic life with the demands of sport, especially as first-year students. A unique Laurier program helps make that balancing act easier. "The university experience is so much different than high school," says Jacky Normandeau, a member of the Laurier women's soccer and hockey teams. "By the time you figure out how to get to your classes, how to get to practice on time and when to do your laundry, it's a big adjustment. "When I arrived at Laurier, I found the Athlete Academic Success program very helpful because it suggested different ways of learning." Launched in 2007, Laurier's Athlete Academic Success program provides student athletes with the tools they need to succeed academically. The program includes mandatory study halls and workshops throughout the year, delivered in a manner that accommodates the training and competition schedules of student athletes. As part of the program, student athletes learn time-management strategies and study skills designed to help them achieve their full academic potential and build structure in their lives. "Laurier really takes the academic success of student athletes seriously – they care that you succeed." The Athlete Academic Success program stands apart from other academic assistance programs because study halls are led by senior student athletes – known as "athlete academic coaches" – who have achieved a high level of academic success. 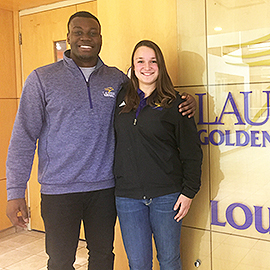 "Whenever Jacky and I are giving a workshop, or giving tips on how to take notes in class, it's tangible because it's coming from someone who has gone through the same challenges and made the same sacrifices that new student athletes will have to make," says Kwaku Boateng, a member of Laurier's football team and an athlete academic coach. "That's what the program is all about: creating that relationship, making sure you're providing something that is real, honest and relatable." It's a successful strategy. The graduation rate for Laurier student athletes is more than 95%, according to a study by Laurier Kinesiology and Physical Education Professor Bill McTeer. As student athletes, Boateng and Normandeau were required to participate in the Athlete Academic Success program during their first year. Now both in their final year, they are helping fellow student athletes as athlete academic coaches. "We get to continue the community culture at Laurier," says Normandeau. "I'm proud to be here and if I can help anyone else with their work I'm glad to do it." "With student athletes coming in fresh, you're given the chance to mould them into the exceptional student athletes that they can be," says Boateng. "That's an amazing experience to be a part of." Tammy Rowe, a learning strategist in Laurier's Centre for Student Success, coordinates the Athlete Academic Success program. She says athlete academic coaches don't take their job lightly. "I am blown away by the attention to detail and level of consciousness they bring," says Rowe. "They're engaged, they're active and they're excellent role models." Laurier's Athletics and Recreation department is built on three pillars: academic success, athletic success and community engagement and involvement. "For us, the academic component is the biggest," says Ryan Lannan, manager of inter-university sport programs at Laurier. "Without the academic success you can't play your sport. And their degree will take them much further than their sport." About 100 new student athletes arrive at Laurier each year and there are about 200 campus visits by student athletes considering attending Laurier. "The program is our No. 1 focus when we have a campus visit," says Lannan. "Our big focus is on our first-year incoming student athletes who are making the transition from high school and making the move away from home. It's about finding balance for the student athlete, both in academics and their sport." While the Athlete Academic Success program is mandatory during first year, student athletes can choose to remain in the program for their entire time at Laurier. When she first arrived, Normandeau says her coaches were among the first to stress the importance of academics. Maintaining that focus can be challenging, considering student athletes can spend up to 30 hours a week on their sport. "Laurier really takes the academic success of student athletes seriously – they care that you succeed," says Normandeau. "I remember one of my coaches saying when I got here: 'We have one of the best academic averages of all the teams – let's keep that going.' They don't only speak athletics; it's also about academics." "Our big focus is on our first-year incoming student athletes who are making the transition from high school and making the move away from home. It's about finding balance for the student athlete, both in academics and their sport." The Athlete Academic Success program also serves to build a sense of camaraderie among Laurier's student athletes, no matter what sport they play. Because all first-year athletes are required to participate, they make connections with other student athletes that last through their entire time at university. "The school is a very close-knit family and it comes down to the fact that we have a pretty small student population here," says Boateng. "We have a pretty sizeable crop of student athletes that come in every year and everyone is close with one another. We all socialize and that makes a nice culture to come into." Along with the pressures that come with academics and sport, Boateng says student athletes have the responsibility of representing Laurier in a very visible way. "Most of the students recognize you as a student athlete," says Boateng. "I think that within itself requires a higher standard. Whatever you do – positive or negative – people are going to be looking at you. You focus on your sport and you focus on your academics – and that's what being a student athlete is all about."